After neutering, the nutritional needs of cats changes and their metabolism can slow down. 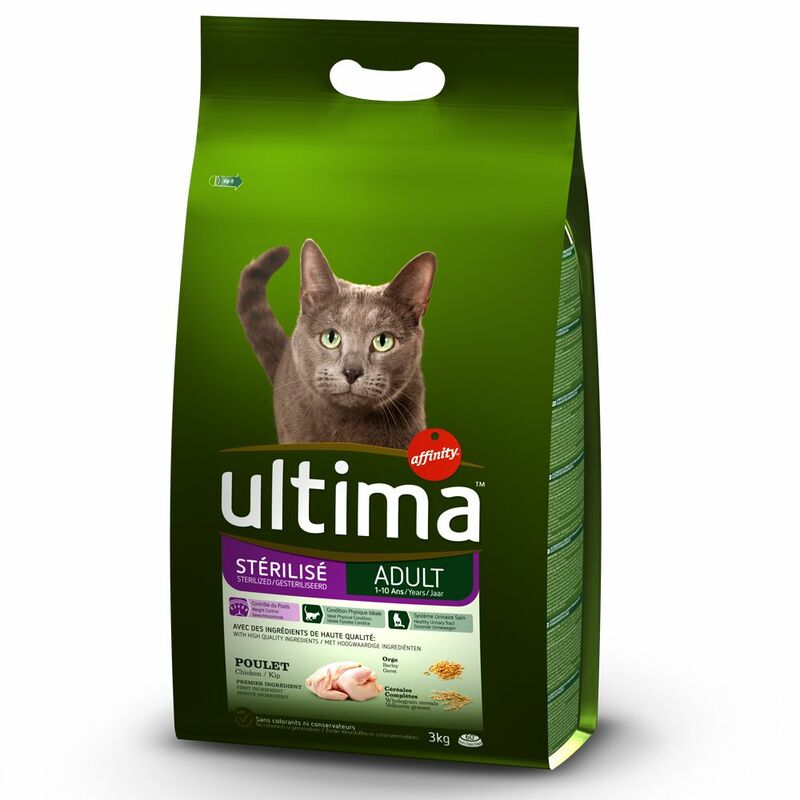 Ultima Adult Sterilised - Chicken and Barley has been formulated to work against the tendency of neutered cats towards weight gain, as well as aΒociated urinary tract sensitivity. A low calorie and fat content, plus added L-Carnitine, which boosts the metabolism, helps your cat to maintain a healthy weight. Appropriate sodium levels prevent urinary tract problems and produce an optimum urine pH, to reduce the likelihood of urinary crystal formation or bacterial infections of the bladder and urinary tract. Ultima dry cat food is highly nutritious and contains a unique blend of antioxidants, vitamins, minerals and eΒential fatty acids to strengthen your cat's immune system and overall wellbeing. Protein from chicken also helps to keep muscles lean and strong and combined with omega-3 and omega-6 can help to encourage a healthy skin and shiny fur. As with all Ultima products, only the best ingredients are used, under strict quality controls. The product is gently steam cooked to preserve the natural nutrients and flavours of the original ingredients, which helps Ultima foods to be well accepted. Ultima Adult Sterilised - Chicken and Barley dry cat food at a glance High quality complete food for adult cats Specially adapted to the nutritional needs of neutered cats with a tendency to be overweight and with a sensitive urinary tract Light recipe: lower fat and calories, enriched with L-Carnitine that can help to speed up the metabolism Anti-infection: recipe with an adapted sodium content to help to maintain the correct pH in urine, which in turn helps to prevent bacteria from spreading and minimise urine crystal formation Balanced nutrition: ideal combination of proteins, vitamins, and minerals for good health and vitality With Omega-3 and Omega-6: for healthy skin and a shiny coat With chicken: a good quality source of protein and provides energy and the basis for strong, lean muscle With wholegrain cereals: sources of good carbohydrate that help regulate digestion With taurine: to support cognitive function, eyesight and nerves Gently steam cooked: to preserve nutrients and flavour High standards of food safety: strictly controlled manufacturing proceΒes with high standards Resealable pouch: for freshneΒ Tasty kibble: oven-dried No colourings or preservatives.